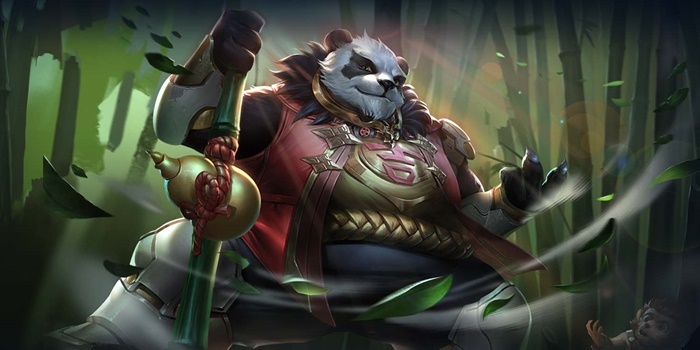 A guide to Arena of Valor's Zuka, the Pandharma Master. Zuka is able to jump into battle and strike enemies with his bamboo staff. His mobility is near unmatched, able to roll around the battle field to get close or evade enemy attacks. Zuka is a warrior/assassin who can jump past the enemy front lines and deal massive damage to everyone around him. He uses his martial arts prowess to bash enemies with his bamboo staff. His strong attack damage and excellent mobility make him great at isolating heroes and bursting them down. Very High Mobility – Zuka is very mobile, all of his abilities able to be used either to engage or escape from enemies. When comboed together, he can leap up to four times. These also allow him to pass through walls, making Zuka a very hard hero to outmaneuver. High Damage Output – Zuka’s damage is nearly unmatched by other junglers within the game. In addition, his passive gives him a ton of damage after attacking enemy heroes every 20 seconds. All of his abilities also empower his auto attacks every time they are cast, making him one of the best warrior/assassin junglers in the game. Cooldown Based Hero – None of Zuka’s abilities require mana, only limited by their cooldowns. This, in turn, lessens his burden when casting abilities, letting him spam them as much as he wants in team fights. Difficult – Despite his high damage output and no-cost abilities, Zuka can be hard to play. A character who moves with each ability cast can be difficult to control for new players. You need to know when to enter a team fight and when to exit, pacing your ability usage to fit these situations. Squishy – Zuka can be easily burst down by mages and other carries. His kit also forces him to get into the middle of team fights to attack the team’s squishier heroes. As such, a single mistake can spell danger for him. Building tanky is also not recommended as your damage potential will fall off as a result. Zuka can be used either in the jungle or in the Slayer lane. His abilities are both good for ganking or in dominating duels. Use Zuka’s ganking potential to put pressure on the lanes as much as possible. Max Pain on a Stick first. This will serve as his main damaging ability as well as his best means of movement. Panda Chariot should only be focused first if the shield is assisting a lot in team fights. Take note that the shield’s scaling relies more on your attack damage than its level. Level Skyfall whenever it’s available. Solo Fights – Open up with Skyfall, or use Panda Chariot to enter the fight with a defensive edge. Alternate your abilities with basic attacks to take full advantage of the enhancement that each ability provides. Your abilities will make it very difficult for your target to escape, as the movement will let you stick close to them. Try only to engage when The Chi is available in order to maximize your damage output. Team Fights – Don’t put yourself in positions where you will be taking a lot of damage. You want to be at the back of the fight, picking off the squishy damage dealers. Wait for your tanks and initiators to start the team fight and for the fight to pick up steam. Once their tanks and initiators are preoccupied, jump to the squishy targets with Skyfall before unleashing the rest of your abilities. Escaping Fights – Zuka’s full set of movement abilities makes escaping very easy. Any one of them can be used to jump through walls, Pain on a Stick can even be used twice in succession. The Chi – Every 15 seconds, dealing damage to an enemy hero triggers Zuka’s Chi, increasing his attack damage by (15/20/25/30)% of attack damage (increasing at level 5/9/13) for the next 5 seconds. This effect stacks with his abilities’ empowerment of auto attacks. Use this in unison with his abilities to deal the maximum damage possible. Pain on a Stick – Zuka raises his staff and charges forward, dealing 135/160/185/210/235/260 (+0.9 AD)ˀ physical damage to nearby enemies. This ability can be used again within 5 seconds of the first use and each use enhances Zuka’s next normal attack, increasing its range and dealing an additional 60(+20 per level) (+0.25 AD) physical damage. It’s important that you auto attack after each cast of this ability. Casting the ability a second time before attacking will waste some of its damage potential. Panda Chariot – Zuka rolls forward, dealing 100/120/140/160/180/200 (+0.35 AD) physical damage to enemies in his path. On a successful hit, Zuka gains a shield that absorbs 250/300/350/400/450/500 (+1.5 AD) damage for 2.5 seconds and enhances his next normal attack to deal an additional (+0.5 AD) physical damage and knocking enemies into the air for 1 second. When the shield disappears or is destroyed, Zuka gains a recovery effect that recovers 30 (+10 per level) (+0.1 AD) per second for 3 seconds. Panda Chariot is best used near enemies, as the shield only activates when you hit one with the initial roll. This is also a great ability to use against escaping enemies, the empowered auto attack gaining a knock up. When ganking enemies, you can use this after Skyfall to further suppress the target. Skyfall – Zuka leaps up and crushes his enemies from above, dealing 500/650/800 (+1 AD) physical damage to enemies in the target area and stunning them for 1 second. His next normal attack will deal an additional 70 (+40 per level) (+0.25 AD) physical damage to nearby enemies. Cast Skyfall from the brush to surprise your opponents. When ganking, wait for your passive before using this ability in order to deal as much damage as possible. Zuka has a ton of mobility to catch unsuspecting enemies from far away. Be sure to teleport back to base immediately when you are in critical health. It’s best to kill Zuka immediately when he enters a team fight. He is a fairly squishy hero that can easily be killed with bursty abilities and crowd control. Zuka will benefit most from arcana that enhance his damage output. Taking Onslaught, Assassinate, and Skewer will make him more effective in skirmishes and teamfights. Players can alternatively take defensive arcana in order to stay in fights longer. Indomitable, Benevolence, and Valiance are good choices in this regard. Zuka will have a difficult time against tanks, especially if they have a lead in items and levels. Avoid engaging them except for in team fights, and not until after all of their allies have been slain. This will be a rather even match-up. Don’t forget to time your abilities correctly and never spam them without auto attacking in between casts. Assassins deal a lot of damage, but Zuka does as well. Interrupt an enemy assassin’s combos by casting Panda Chariot to give yourself a shield and a stun. You can also use Skyfall to disrupt their combo. Assassins won’t do be able to do much after using their abilities. You can trade with them, but don’t solo a mage until you are sure you can burst them down. Mages have their own powerful burst damage and control abilities that can make dealing with them rather rough. Try to avoid their skill shots with your abilities while moving in to attack. Marksmen are easy targets for Zuka since he can easily get close to them and burst them down. His only problem will be when a marksman is with a support. Marksmen will be your highest priority in team fights, so always target them before anyone else. Just like with marksmen, supports are easy to kill. They should not be your top priority in team fights, however. Only kill them when you catch them alone or their HP is critical.